Michael Schumacher says he remains motivated for Sunday's Japanese Grand Prix despite doubts over his future. Mercedes announced last week that McLaren's Lewis Hamilton will replace the seven-time world champion in 2013. 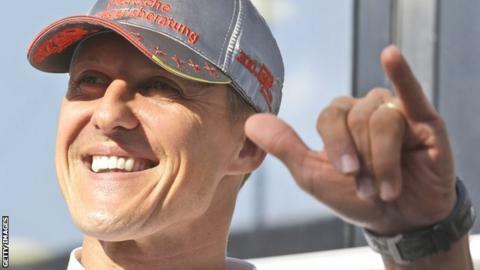 "My motivation is completely intact after the news," said Schumacher, who has been linked with a move to Sauber. "It would also be nice to achieve a sporting highlight this weekend, although my chances are very limited because of a grid penalty." Schumacher will drop 10 places on Suzuka's grid after being punished for crashing into the back of Jean-Eric Vergne's Toro Rosso during the Singapore Grand Prix, forcing both of them to retire. The 43-year-old has retired seven times in 2012, but there were high points in Monaco, where he stormed to pole position, and in Valencia, where he finished third. On his chances in Japan, Schumacher said: "I've always approached these things as a challenge. "Suzuka is one of the season's highlights for me. I enjoy the circuit - it has sections that challenge you as a driver like almost nowhere else. "Then there are the fans - they love motor racing and it is fun to feel their passion." After an illustrious career, Schumacher came out of retirement to race for Mercedes in 2010 and his manager Sabine Kehm said last week that he was still undecided about whether he wanted to race on with another team. There has been speculation he could replace Sergio Perez at Sauber following the Mexican's switch to McLaren, while a move into a non-racing role at Mercedes is also a possibility.